Thales will supply signalling, communications and operational control centre system for the Danhai LRT. Image courtesy of Thales Group. Voith Engineering Services will develop new low-floor trams for the Green Mountain Line. Image courtesy of Voith. TÜV Rheinland Greater China has been contracted to provide validation and verification services for the Danhai LRT. Image courtesy of TÜV Rheinland. The light rail is being developed by China Steel Corporation, along with its subsidiaries United Steel Engineering & Construction Corporation and Taiwan Rolling Stock Company. A comprehensive planning report for the project was approved in February 2013 by the central government. The multi-phased project is estimated to be completed over a ten-year period at a cost of NT$31.357bn ($998.39m), whereas the first phase is expected to cost NT$9.699bn ($308.81m). The project is planned to establish a robust public transport system to deal with the growing population of Danhai, a popular township that has been created recently. Danhai’s population is expected to grow to 340,000 by 2041. The phase one line is expected to handle 80,000 passenger rides a day upon completion, while an additional 50,000 new residents are expected to move to Danhai New Township. The light rail will encompass two transit lines, namely the Green Mountain line and the Blue Seaside line, along with one depot. It will comprise both elevated and surface tracks. A total of 13.99km of tracks will be laid as part of the project, and 20 stations will be constructed along the two transit lines. The project will also include the construction of rails, bridges, depot facilities, media and energy provisions. The first phase of the LRT will cover a distance of 9.7km, including a 5.2km at-grade section and a 4.5km elevated section. The initial phase will include the construction of 11 stations along the Green Mountain route and three stations on the Blue Sea route as well as the depot. The second phase of the project will cover the construction of the remaining stations of the Blue Seaside line and will be completed in 2024. The Green Mountain line has a total of 11 stations, while the Blue Seaside route includes nine stations. 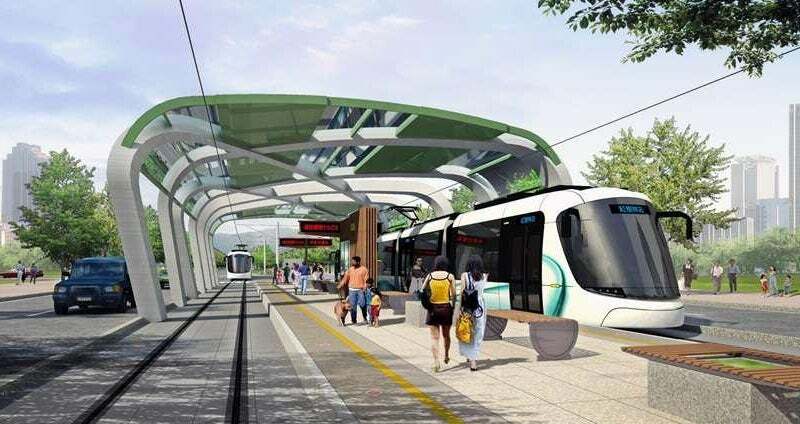 The Green Mountain line will stretch for approximately 8km and link the centre of the New Taipei City with Danhai, while the Blue Seaside will connect the coast to the city centre. The Green Mountain Line will start from the Hongshulin MRT station and run along Shuiyuan Street, Beixin Road, Binhai Road and Shalun Road before ending near the Danhai New Town project. The Blue Seaside line will have three stops and terminate at Fishermen Wharf Station. The first phase will be operated with 15 34.5m-long, bi-directional trams with a low-floor design and five separate sections. Designed to be standard gauge, the trams will run for longer distances and across track sections without overhead wires. They will also be designed to store additional energy. A prototype is scheduled to be delivered by the end of 2016, with the first tram operating on Green Mountain line in 2018. The rail vehicles will be supplied by Taiwan Rolling Stock Company in collaboration with Voith Engineering Services. Voith will be responsible for the tram development, which includes the concept, design, commissioning and analysis. It will also provide training to the employees of Taiwan Rolling Stock Company. Voith will produce the prototype vehicle, as well as support production and factory planning. It will also design the fixtures for welding assemblies and integrate system components. A €17m ($19.02m) contract was awarded to Thales for providing the signalling, communications and operational control centre system, while an engineering, procurement and construction (EPC) contract for track work has been awarded to CTCI Corporation. Pandrol has been selected to supply its track fastening solutions along with installation and maintenance equipment and rail safety products for the Danhai LRT. It will also install its QTrack embedded track system. A contract for independent verification and validation for civil, electrical, mechanical and rolling stock of the project has been awarded to TÜV Rheinland Greater China. ABB will supply its Compact Converter BORDLINE® CC400 equipped with an energy storage system for the project.